∗ A large number of new end–of–chapter problems with varying degrees of difficulty. ∗ PSpice(r) –based simulation examples to illustrate basic concepts and help in the design of converters. PSpice(r) is an ideal simulation tool for this purpose. ∗ A newly developed magnetic component design program. This program is extremely useful in showing design trade–offs, for example, the influence of switching frequency on the size of inductors and transformers. ∗ PowerPoint–based slides for all chapters that help summarize topics throughout the text. 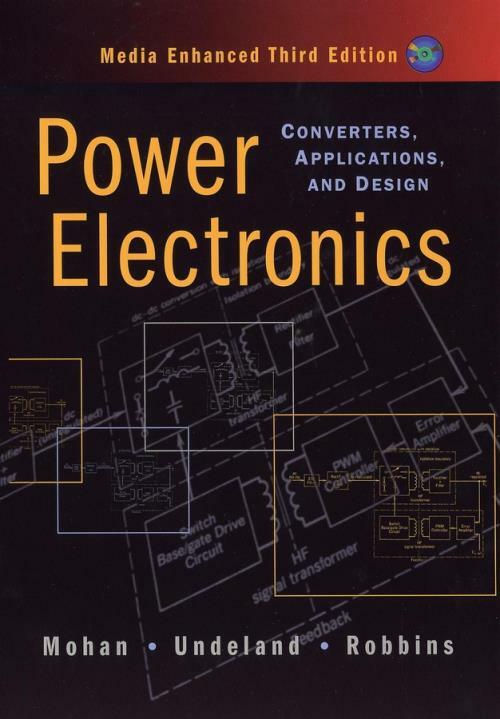 The text also explores industrial and commercial applications, as well as practical aspects of power electronic converter design, such as snubber circuits, drive circuits, circuit layout, and heat sinks. Please visit [external URL] for additional information. Chapter 1. Power Electronic Systems. Chapter 2. Overview of Power Semiconductor Switches. Chapter 3. Review of Basic Electrical and Magnetic Circuit Concepts. Chapter 4. Computer Simulation of Power Electronic Converters and Systems. PART 2. GENERIC POWER ELECTRONIC CIRCUITS. Chapter 5. Line–Frequency Diode Rectifiers: Line–Frequency ac Uncontrolled dc. Chapter 6. Line–Frequency Phase–Controlled Rectifiers and Inverters: Line–Frequency ac Controlled dc. Chapter 7. dc–dc Switch–Mode Converters. Chapter 8. Switch–Mode dc–ac Inverters: dc Sinusoidal ac. Chapter 9. Resonant Converters: Zero–Voltage and/or Zero–Current Switchings. PART 3. POWER SUPPLY APPLICATIONS. Chapter 10. Switching dc Power Supplies. Chapter 11. Power Conditioners and Uninterruptible Power Supplies. PART 4. MOTOR DRIVE APPLICATIONS. Chapter 12. Introduction to Motor Drives. Chapter 13. dc Motor Drives. Chapter 14. Induction Motor Drives. Chapter 15. Synchronous Motor Drives. Chapter 16. Residential and Industrial Applications. Chapter 17. Electric Utility Applications. Chapter 18. Optimizing the Utility Interface with Power Electronic Systems. Chapter 19. Basic Semiconductor Physics. Chapter 21. Bipolar Junction Transistors. Chapter 24. Gate Turn–Off Thyristors. Chapter 25. Insulated Gate Bipolar Transistors. Chapter 26. Emerging Devices and Circuits. PART 7. PRACTICAL CONVERTER DESIGN CONSIDERATIONS. Chapter 28. Gate and Base Drive Circuits. Chapter 29. Component Temperature Control and Heat Sinks. Chapter 30. Design of Magnetic Components.